Scribentia is a writing blog updated and maintained by a dedicated high school student. Featuring intriguing articles, original prose and art pieces, book recommendations/reviews, and creative writing prompts, strategies, and techniques, Scribentia is a writing blog that is both informative and engaging. 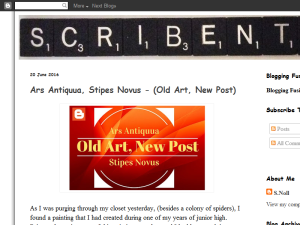 This what your Scribentia Blog Ad will look like to visitors! Of course you will want to use keywords and ad targeting to get the most out of your ad campaign! So purchase an ad space today before there all gone! If you are the owner of Scribentia, or someone who enjoys this blog why not upgrade it to a Featured Listing or Permanent Listing?